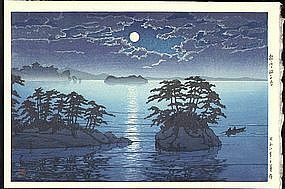 Please refer to our stock # Hasui 016 when inquiring. Condition: Never framed. Excellent color and condition. Kawase Hasui Japanese Woodblock Print - Matsushima and Sailboat - Rare Kawase Hasui Japanese Woodblock Print - Zaimoku Island, Matsushima Kawase Hasui Japanese Woodblock Print - Ueno Toshogu Pagoda - 1st ed.